Rex Davidson is not just a super hero but superhero with a very low IQ. Some would say he is brilliantly stupid. Rex was a future baby like his friend Lex Morgan. Rex's dad was Mr Hero as well, and much like Lex's mom. Rex's mother was a damsel in distress turned one night stand for Mr. Hero. Mr. Hero wanted to keep his liaisons a secret and sent baby Rex into the future to the Future Baby Drop off center where he ran into his other step siblings including Lex Morgan. But when Mr. Hero went to the center for a visit, Lex and Rex managed to sneak out through the portal and arrived at our current timeline. Rex and his friend Lex met Tiffany and Cammi and, along with her fouled mouth twin brother, they all moved together and live in the same household. 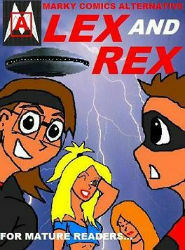 On one of their adventures, Rex and Lex gained a new ability when they were blasted by Aliens From Mars (A.F.M.) agents Mask and Sideshock's disintegration ray. The ray did not destroy them but did the opposite. It enhanced their strength. Physical/energy resistances: Rex shares Mr. Hero's powers and one of these makes him virtually immune to injury. Super strength: His strength has been increased to the level where he can lift around 5 tons. Flight: Rex can fly at around 200 mph. Enhanced intelligence: His intelligence is enhanced but in the wrong way. He is brilliantly stupid. It seems that from where he comes from, his stupidity is a super power. It gives him a childlike demeanor and bubbly presence that often makes females attracted to him. Weaknesses: Rex's child like demeanor tends to give a short attention span which often leads to him singing to himself and ask really dumb questions. Often when he gets abducted by potato sack, he oftens makes unusual statements like "Yay, I smell like potatoes.."
Curiosities: Rex's true love for crayons and cake are as weird as his drug/alcohol induced hallucinations of Kyle the Cotton Candy Dragon and the Happy Crayon Fun Gangwith Happy Cake.